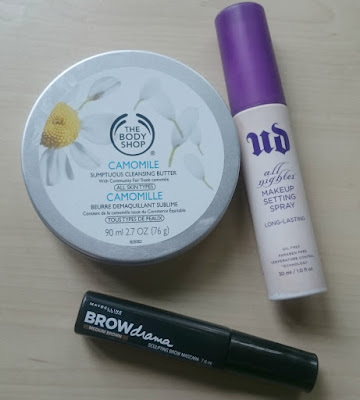 It fees like ages since I've done a proper beauty post so here is a classic for you: My June Beauty Favourites! My first few products are more 're favourites' in that they've been rediscovered and likely featured before. First is the Body Shop Camomile Sumptuous cleansing butter. 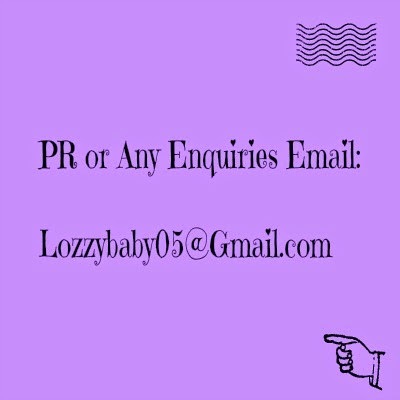 I used up a full one of these and have now got round to repurchasing. Its a butter that melts into an oil which breaks down all your makeup, smells good and leaves your skin soft- how can you not love it? Next is the Urban Decay All Nighter Setting Spray. This stuff is a godsend in the summer, it really does keep my makeup in place through sweating, humidity and a long day. Then we have the Maybelline Brow Drama in Medium Brown. I used to use the Dark Blonde colour but I needed a darker one for my darker hair and this is perfect. It really lasts all day and isn't fussy. On the left we have the Caudalie Grape Water. This stuff is fabulous this time of year as it is a really fine cooling mist, if you keep it in the fridge it is even better. It can help settle (not really set) your make up if it looks a bit powdery or just not fresh. I also find it really nice in the morning before putting on my makeup to waken me up a bit. 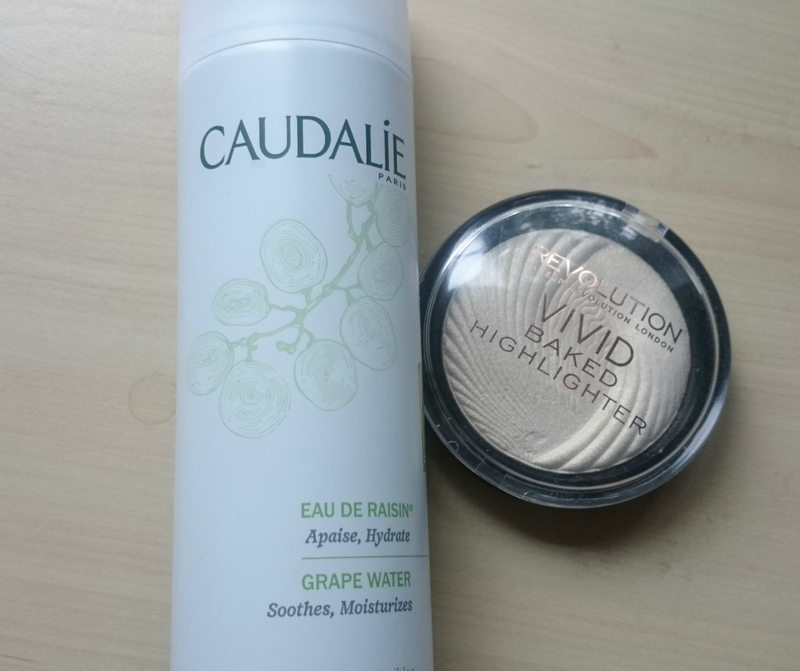 On the right is the Makeup Revolution Vivid Baked highlighter in Golden Lights. At first I didn't like this product as I found it a bit chunky but I've figured out the best way to use it and that's to first almost 'warm it up' on the back of your hand and then apply. I especially love this on the end of my nose (and of course my cheekbones) as a nice light but golden reflective highlight. 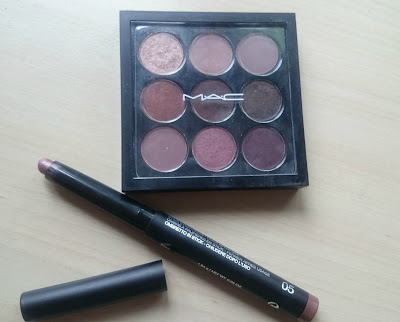 The little palette is the 'Eyes on Mac' Burgundy Times Nine' Palette and I've been using it daily since I got it which is why it looks so well used. I have found my new brow shade from it (embark) there are a couple of fab purpley tones and a beautiful amber-gold frosty shade, it's really nice and compact and versatile and the shadows are great quality- love it! Secondly we have this Kiko Long lasting Shadow stick in the number 05. It does exactly what it says on the tin, lasts ages. I love it because it's quick, easy simple and beautiful on the eyes. And last but by no means least.. LIPS! After my eyeliner hoarding last month I of course have to feature a couple of those and the first is Mac Magenta Lip Pencil (bottom). It's a gorgeous purply-pink which goes well with my beloved 'Sleek- Mystic' and lasts a long time on it's own. I've been wearing it with a body shop lip balm over it. It's not overly drying either. 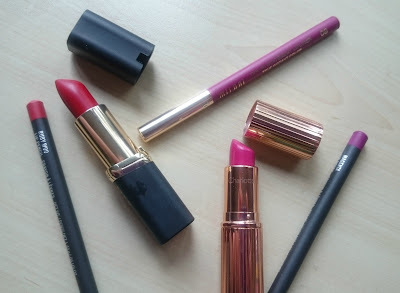 Next is a pink Lip Combo and that is the Milani Colour Statement Lip Liner in 08 Fuchsia (second from bottom) and Charlotte Tilbury K.I.S.S.I.N.G Lipstick in Velvet Underground (middle) They are a similar tone. 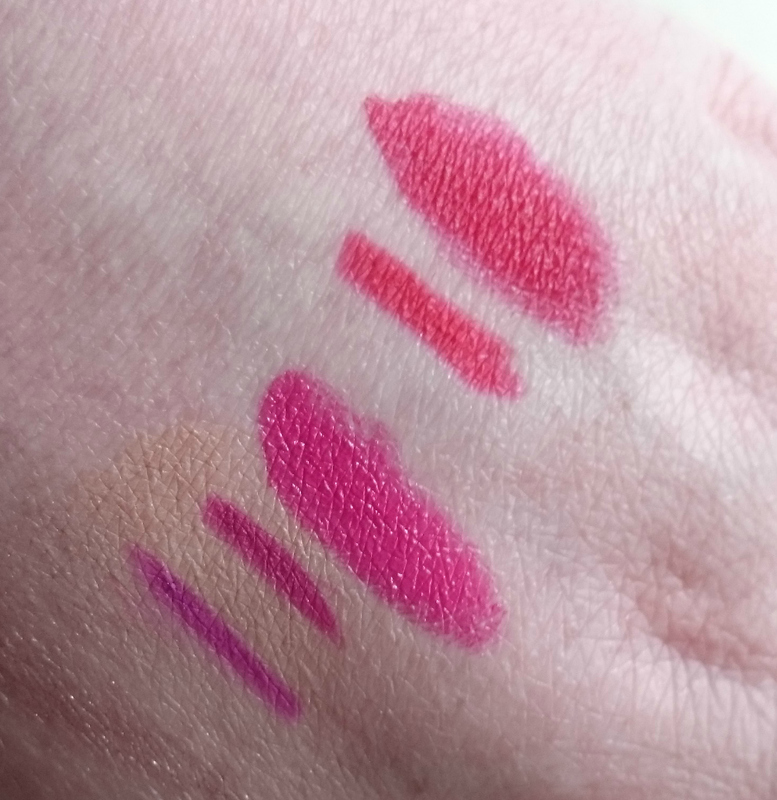 The Milani Lipliner is a more berry tone but it is creamy, easy to apply and lasts well. The Lipstick is also creamy, non drying and lasts well. I think this is a great bold lip alternative to a barbie type pink and is a little more sophis'. Lastly is another Lip Combo but a red one this time. I think I've found my perfect red lip (for now anyway) The Lipliner (second from top) Is MAC Rubywoo Lip Pencil and much like it's lipstick namesake it is a blue toned true red and like magenta lasts well, isn't too drying and is really well pigmented. Along with that I've been using the L'oreal Collection Privee 'Blakes Red' Lipstick, again this is a slightly blue toned true, hollywood red and alone it lasts well but particularly well with a liner. The liner stops the lipstick slipping around as bright lipsticks tend to do. 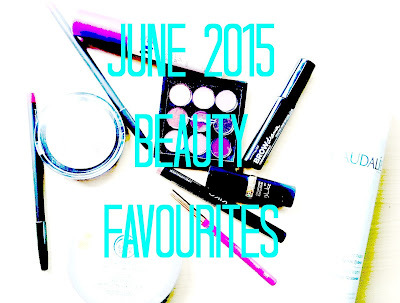 So there you have it, my June Favourites. I've done a video too if you want to cheek it out here or below and please let me know what you've been loving this month in the comments.